This week, on the 111th anniversary of the first powered flight, one of Orville and Wilbur Wright’s most important compatriots was elected for enshrinement into the National Aviation Hall of Fame. Robert N.Hartzell began manufacturing propellers at the suggestion of Orville Wright. That decision would tie his name, and the company that shares it, to some of the greatest advances in aviation history. Now, Robert will live forever among other legends of American Aviation in the Hall of Fame. Robert Hartzell founded the Hartzell Walnut Propeller Company in 1917 and served as President until his passing in 1968. 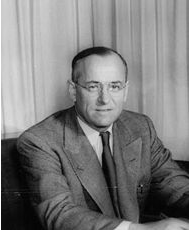 His tenure saw Hartzell through two World Wars, the Great Depression, the creation of Hartzell’s first-and-only aircraft, the development of ground adjustable propellers and constant speed propellers and the end of the era of wooden props. Robert oversaw the creation of many invaluable pieces of modern aviation technology, but one of his inventions stands above the rest as a testament to his prescience. Robert Hartzell holds the world’s first patent for a composite aircraft propeller. Nearly 50 years after its invention, Robert’s eponymous aerospace material, Hartzite, is still the archetype for the world’s most advanced propeller technologies. Materials like carbon fiber and Kevlar have replaced Hartzite’s proprietary blend of plastics, but the initial ingenious bravado of our founder’s concept, that science can create materials stronger and lighter than those found in the natural world, remains the core principle of our ASC-II Advanced Composite Propellers. Robert will be in good company among the rest of The National Aviation Hall of Fame’s class of 2015, which includes Abe Silverstein, the “Father of NASA’s Apollo Missions,” Eugene Kranz, the Mission Director of Apollo 13, and Brig. Gen. Robert L. Cardenas, who aided Chuck Yeager in breaking the sound barrier. The Hartzell team is incredibly proud to see our founder among such distinguished names. You can read more about the newly announced inductees here. The enshrinement ceremony is scheduled for October 2nd, 2015 at the National Aviation Hall of Fame in Dayton, Ohio.